What is your favourite arc so far? What is your favourite moment so far in One Piece? What do you think of One Piece so far? Ok thanks. I am going to sleep now as well lol. I have to go to school early tomorrow. Yh, I was just about to watch the episode lol. When do you plan to watch the episode? I have watched Death Note before but I decided to rewatch it since I forgot mostly all that happens. 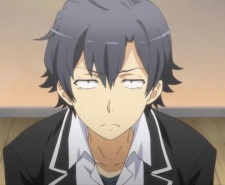 I have been watching clips of Oregairu on youtube regularly because it is so good. I need the next season now. Waiting is too long. Should I send you a link? It really isn't a proper trailer, it just shows old scenes from the 2nd season. It is just a promotional video. Yh I am so excited for the next seaon can't wait.